Occupying a desirable waterfront position this comprehensively internally upgraded three/four bedroom DUPLEX FLAT is set over two levels offering outstanding, immaculately presented stylish living within a “B” listed property. Enviable panoramic views extend over the River Clyde from Dunoon to the Holy Loch continuing beyond the Royal Gourock Yacht Club to Kilcreggan. The property’s westerly aspect is well positioned to enjoy the sunsets over Argyll. Particular features are the quality refitted bright breakfasting kitchen and the current owner’s high standard of internal finish, plus sympathetic choice of decoration which compliments the traditional character of the interior. There is a private rear decked area offering an ideal space for entertaining and enjoying sunny afternoons with family and friends. Specification incudes: double glazing and gas central heating. The interior benefits from ornate detailing to cornices and ceiling roses. Accommodation comprises: Entrance Vestibule by UPVC double glazed door with hardwood flooring. There is a refitted Plumbed Cloakroom with rear window and two piece suite comprising: wash hand basin and wc. The Reception Hallway is reached by a glazed door with hardwood flooring, two storage cupboards and ornate handrail leading to the upstairs apartments. The front facing Lounge features two separate window formations offering contrasting River Clyde views which benefit from window shutters, marble fireplace, feature recess with downlighters and two inbuilt cupboards. There is a Dining Room with side window which could also be utilised as a 4th bedroom. There is a luxury refitted Breakfasting Kitchen with rear window and quality light grey toned high gloss units, grey toned marble style work surfaces and splashback. Appliances include: electric ceramic hob, oven, integrated washing machine, dishwasher and fridge freezer. The Shower Room has a shower cubicle, chrome style shower and wall tiling. Stairs lead to the Upper Landing with double glazed skylight and hatch to the loft. There are two double sized Bedrooms and 3rd single Bedroom. The 1st bedroom features a three light window commanding superb vistas over the river stretching from Dunoon to Gourock’s promenade. Bedroom two benefits from a window box store and “Shaker” style fitted wardrobe. The quality Bathroom with rear window offers a three piece suite comprising: wash hand basin, wc and spa bath, plus splashback tiling. Immediate inspection is essential for this excellent home on Gourock’s waterfront. EPC = D.
This two bedroom GROUND FLOOR FLAT offers an ideal rental investment opportunity and is available to purchase with the current tenants who are on a PRT lease agreement with monthly rent of £350 being achieved. Lies convenient for transport facilities and amenities. Specification includes: double glazing and electric heating. Communal rear drying green. Apartments comprise: Entrance Hallway with laminate floor and three inbuilt cupboards. The airy Lounge has windows to the front and side, shelved alcoves and fire surround. There is a fitted Kitchen with rear window and oak style units, glazed display cases, grey/black high gloss marble style work surface areas and splashback tiling. Appliances include: canopy extractor hood, ceramic hob, electric oven, washing machine and integrated fridge/freezer. There are two double sized Bedrooms both with fitted wardrobes. The Bathroom with rear window has a three piece suite comprising: pedestal wash hand basin, wc and shower bath with “Triton” shower. Additional features include: chrome style heated towel rail, wall and floor tiling. Early viewing advised for this affordable rental investment opportunity. EPC = E.
This well presented freshly decorated and newly recarpeted two bedroom GROUND FLOOR FLAT offers unfurnished accommodation. Lies convenient for transport facilities and amenities. Specification includes: double glazing and electric heating. Apartments comprise: Entrance Hallway with two inbuilt cupboards. The Lounge has windows to the front, shelved alcoves and fire surround. There is a fitted Kitchen with rear window and oak style units, glazed display cases, grey/black marble style work surface areas and splashback tiling. Appliances include: ceramic hob, electric oven and washing machine. There are two double sized Bedrooms. The Bathroom with rear window has a three piece suite comprising: pedestal wash hand basin, wc and bath with electric shower. This elegant and substantial three/four bedroom FIRST FLOOR FLAT occupies the entire first floor of this sandstone property which occupies a highly desirable West End location overlooking leafy Ardgowan Square. The immaculately presented interior retains a host of traditional features including period doors, surrounds, skirtings, ornate detailing to cornices / arches and period style bath which all add to the character of this excellent family home. Specification includes: gas central heating and double glazing. There is a shared rear drying green with well stocked borders, plus a a former communal wash house. A particular feature is the private Cellar / Workroom with light and power installed, workbench and rear window. There is a further store which is a former coal cellar offering additional storage. Accommodation offers a flexible layout within this home which lies in the catchment for well regarded primary and secondary schools. Lies convenient for the town centre and Greenock West railway station with a frequent service to Glasgow, which is ideal for commuters. Superb apartments comprise: Entrance Vestibule by stout timber door which in turn gives access to the spacious grand Reception Hallway by further glass panelled door with ornate detailing, inbuilt cloakroom and 2nd cupboard. There is ample space for a dining table and chairs within the hallway. The airy front facing Lounge enjoys enviable views over Ardgowan Square and is an ideal space for entertaining with feature fireplace, tiled surround, alcove and walk in cupboard. There is a separate bright Living Room which could also be a 4th bedroom with its corner position benefiting from windows to the front and side. The fireplace features a marble surround and living flame gas fire. The Dining Kitchen has a range of quality off white fitted units with glazed units, beech style work surfaces and splashback tiling. Appliances include: range gas cooker, fridge freezer, integrated dishwasher and washer dryer. There is ample space for table and chairs within this apartment which is ideal for family living. Further features include: two inbuilt cupboards and pulley. There are two double sized Bedrooms and further 3rd single Bedroom. Bedroom 1 offers an inbuilt cupboard and shelved alcove with glazed doors. The Bathroom with side window benefits from a three piece suite comprising: wc, period style pedestal wash hand basin and period style bath, plus an electric shower. Immediate viewing is essential for a rare opportunity to purchase this West End family home showcasing a wealth of period features. EPC = C.
glazing, gas central heating and security entry. Apartments comprise: Entrance Vestibule with inbuilt cupboard. There is a Reception Hallway with laminate floor. The front facing Lounge commands views towards the River Clyde with corner sofa unit. There is a quality fitted Kitchen with oak style units, high gloss marble style work surfaces and splashback tiling. The range of appliances includes: stainless steel chimney extractor hood, gas hob, electric oven, fridge and washing machine. There are two double sized Bedrooms with double beds in each room. The Bathroom with rear window has a three piece suite comprising: wash hand basin, wc and bath with electric shower. There is a chrome style heated towel rail and partial wall tiling. No smokers, no pets. Subject to financial criteria checks. LLR= 73700/280/23290. Letting Agent Registration Number = LARN1901039EPC = C. Council Tax = A. This well presented, freshly decorated unfurnished one bedroom TOP FLOOR FLAT commands superb views over Greenock to the River Clyde. Specification includes: double glazing and electric storage heating. There is a communal laundry room, shared drying green and communal bin store. edestal wash hand basin, wc and bath with overhead “Triton” shower. Offering an affordable home set over two levels this well presented two bedroom FIRST FLOOR MAISONETTE FLAT features a south facing balcony which is accessed from the lounge. Lies convenient for local schooling and is close to both road and rail transport facilities. Offers an ideal rental investment opportunity or first time purchase. Specification includes: double glazing and partial electric heating. the building is protected by a security door entry system. There is a communal rear drying green and private cellar store. Accommodation comprises: Entrance Hallway by UPVC double glazed door with laminate flooring. There is a rear facing airy Lounge with two windows and UPVC double glazed door to the south facing balcony which is an ideal space to enjoy sunny days. The Breakfasting Kitchen with front window benefits from antique pine style units, marble effect work surfaces and wall tiling. Appliances include: canopy extractor hood, stainless steel gas hob, electric oven, washing machine, integrated fridge and freezer. The breakfast bar offers space for two stools. Stairs lead to the Upper Landing with inbuilt cupboard and hatch to the loft. There are two double sized Bedrooms. Bedroom 1 is a bright apartment with three light window formation and also features fitted wardrobes providing useful storage. The Shower Room with window has a three piece suite offering: pedestal wash hand basin, wc and shower cubicle with “Heatstore” shower. Additional specification includes: wall and floor tiling. Offering airy, stylish and spacious family living in a sought after West End location this immaculately presented three bedroom FIRST FLOOR FLAT occupies a desirable corner position. The owner’s choice of contemporary design and finishes perfectly compliments the ornate traditional detailing within the property. A particular feature is the luxury refitted bathroom. Lies convenient for Ardgowan Square and a host of amenities including Greenock West railway station, Ardgowan Primary School and the town centre. Specification includes: double glazing and gas central heating with newly installed boiler fitted in early 2019 which owner advises benefits from a five year guarantee. There is a security door entry system. Shared rear drying green. Private cellarage. Suits variety of purchasers including families, first time buyers and rental investors. The superb apartments comprise: Entrance Vestibule by UPVC door with tiled floor leads to the welcoming Reception Hallway with hardwood flooring. The bright and spacious Lounge enjoys a corner position with windows to the front and side, plus benefits from ornate cornicing and ceiling rose. The spacious Dining Kitchen features light blue toned units with stainless steel handles, light oak style work surfaces and splashback tiling. There is ample space for table and chairs which is ideal for family living, plus a recess and useful inbuilt cupboard offering generous storage. Appliances include: stainless steel chimney extractor hood, gas cooker, dishwasher and fridge/freezer. There are two double sized Bedrooms and third single Bedroom. The 1st bedroom has a bank of fitted wardrobes which offer excellent storage. The luxury refitted Bathroom has a quality three piece suite comprising: vanity wash hand basin set within white high gloss unit, wc and bath with chrome style shower. There is quality wall and floor tiling with feature recess and chrome style heated towel rail. Offering a spacious bright home this two bedroom SECOND FLOOR FLAT occupies a corner position close to the Town Centre. Lies convenient for shops and transport facilities. Ideally suits variety of buyers including rental investors. We are advised the current owner has lived in the property since it was built in 1957, so this is the first time the flat has been advertised on the market. Specification includes: double glazing, gas central heating and the building is protected by a security entry system. There is a shared rear drying area. Resident’s can apply to the local authority for a parking permit. We are advised the building is managed by a long term property factor. A degree of redecoration and upgrading is required which is reflected in the asking price. Generous sized accommodation comprises: Entrance Hallway by timber door with single glazed panel, inbuilt cupboard and security entry phone. The south facing Lounge is an airy apartment. There is a fitted Kitchen with rear window, beech style fitted units, cherrywood effect work surfaces and inbuilt cupboard. Appliances include: gas cooker, fridge/freezer and washing machine. There are two spacious double sized Bedrooms, both featuring two window formations. The Shower Room with rear window has a three piece suite comprising: pedestal wash hand basin, wc and shower cubicle with “Mira” shower. There is partial wet wall panelling. This uniquely designed five bedroom luxury EXECUTIVE DETACHED VILLA offers a stunning family home within a much admired waterfront cul de sac location next to the River Clyde which allows for direct access to the shore from the landscaped rear garden. The current owner customised the original design when it was being built and this is the first time the house has been on the market since construction in 1998. This home is finished to an exacting standard offering high quality internal finishes and ornate detailing throughout. A particular feature is the outstanding spacious conservatory with electric roof hatches which offers a superb space for relaxing / dining with family/friends and to watch the sunsets over the Cowal hills in the west. There is a double garage with new “Hormaan” remote control electric door and courtesy door, plus monoblock driveway providing further parking for several cars. The building is protected by an alarm system. Specification includes: gas central heating and double glazing. Many rooms feature quality floor tiling or “Amtico” flooring. An integrated vacuum system has been installed. There are lawned landscaped gardens which extend to the front and rear. The generous sized rear garden can be reached directly from the conservatory and features a decked area and further deck next to the hot tub. There are mature shrubs and trees in the front garden. Superb apartments comprise: welcoming Hallway by UPVC double glazed door with inbuilt cupboard. The luxury Plumbed Cloakroom has a two piece suite comprising: vanity wash hand basin and wc. Further features include: wall tiling and chrome style heated towel rail. There is spacious Lounge with ornate marble fireplace and inset living flame gas fire. Glazed double doors lead to the separate front facing bay windowed Dining Room and also the Kitchen. Additional patio doors provide access to the large rear facing Conservatory which commands superb views beyond the garden towards Innellan and the Cowal Peninsula. The luxury Breakfasting Kitchen benefits from quality white gloss units, granite style work surfaces, waste disposal and wall tiling. Appliances include: range style gas cooker dishwasher, fridge/freezer and microwave. The breakfast bar provides space for four stools. There is a side Hallway with courtesy door to the garage. The Utility Room has white unit, granite style work surfaces, wall tiling and inbuilt storage cupboard. Stairs lead to the airy Upper Landing with inbuilt cupboard and hatch to the partially floored loft. A Study area is set within part of the upper landing. The Master Bedroom is rear facing ensuring it benefits from the impressive views and feature a bank of fitted mirrored wardrobes. There is an luxury Ensuite Bathroom with side window and impressive suite offering: “His & Hers” vanity wash hand basins set within white unit, spa bath, bidet, wc and shower cubicle. Additional specification includes: wall and floor tiling, heated towel rail, plus downlighters. There are four further double sized Bedrooms all benefiting from fitted wardrobe storage. The quality Bathroom with rear window has a four piece suite comprising: vanity wash hand basin set within white unit, wc, corner bath and shower cubicle. Further features include: heated towel rail, wall and floor tiling. This immaculately presented and generous sized stylish two bedroom TOP FLOOR FLAT offers bright contemporary living within a traditional blonde sandstone West End property. The immediately impressive interior benefits from a luxury “Pronorm” designer fitted kitchen and quality bathroom. There is a private cellar and shared rear drying green. Specification includes: double glazing, gas central heating and security door entry system. Ornate detailed cornicing and ceiling roses further add to the flat’s character. The property lies convenient for local schooling including Ardgowan Primary. Greenock West railway station offers a frequent rail service to Glasgow which is ideal for commuters and is just a short walk from the flat. Offers an excellent first time purchase or rental investment opportunity. Stunning apartments comprise: Entrance Vestibule by double timber doors with tiled floor leads by single glazed door to the welcoming Reception Hallway which has an inbuilt cupboard. The airy spacious Lounge has a three light bay window formation and ornate fireplace with inset log effect gas fire. 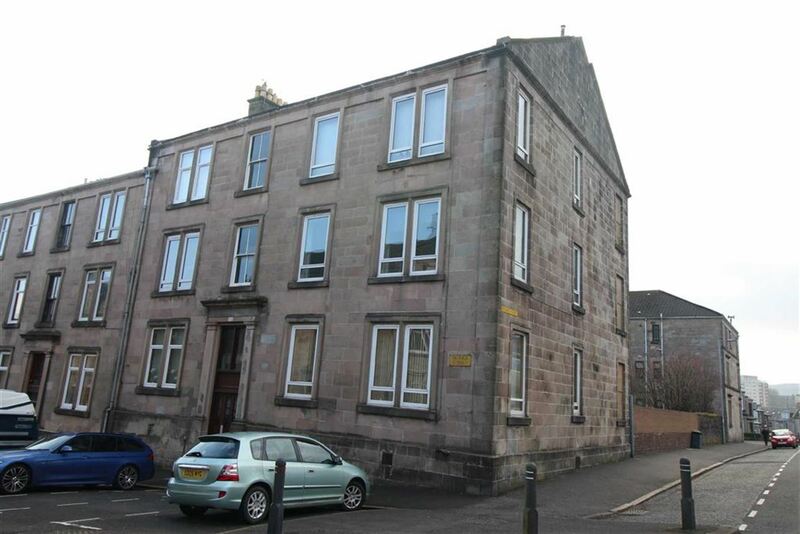 There is a bright generous sized rear facing Dining Kitchen with two windows overlooking Greenock. A particular feature are the luxury “Pronorm” grey toned fitted units which are complimented by oak style work surfaces and matching splashback. Appliances include: stainless steel chimney extractor hood, five ring gas hob, double electric oven, integrated microwave, fridge/freezer and dishwasher. This is an ideal space for entertaining with plenty of room for a dining table and chairs. There are two double sized Bedrooms. Bedroom 1 features a shelved alcove and ornate detailing. The Dressing Room provides a useful storage place which could also be a study. There is a luxury Bathroom with rear window which benefits from a quality three piece suite comprising: vanity wash hand basin set in glazed unit, wc and bath with shower. Additional specification includes: wall and floor tiling, chrome style heated towel rail and shelved alcove. Viewing is essential for this excellent West End home. EPC = D.
This well presented two bedroom GROUND FLOOR FLAT is set within an attractive red sandstone property centrally positioned within the West End. The property lies close to the West Station area with all its amenities including the railway station with frequent service to Glasgow. Would suit a variety of buyers including first time purchasers, the retired market and rental investors. Specification includes: double glazing, gas central heating and security door entry system. There is a private front garden and shared rear drying green which enjoys an open aspect. A private cellar provides useful storage. The communal entrance features period style wall tiling and ornate handrail. Impressive apartments comprise: Entrance Vestibule by double door with single glazed panel above. The welcoming Reception Hallway is reached by a timber door and benefits from a walk in storage cupboard. There is a bright front facing Lounge featuring a three light bay window, ornate cornice / ceiling rose, alcove, plus fireplace with marble surround and gas fire. The Kitchen has white high gloss units, grey granite style work surfaces and splashback tiling. Appliances include: stainless steel gas hob. electric oven and washing machine. There are two double sized Bedrooms. The front facing bedroom has fitted mirrored wardrobes. The quality Bathroom with rear window features a three piece suite including: pedestal wash hand basin, wc and bath with “Gainsborough” shower. Additional features include: folding shower screen, partial wall tiling /timber panelling and tiled floor. Early inspection is recommended for this excellent West End home. EPC = D.